Other times I’ve corrected mistakes in pronunciation or how he eats. The mother in me fixes his hair, straightens his jacket or shirt, or points out that his socks are all wrong with those shoes. Things I promised myself I would never do in my marriage. Graciously my husband absorbs most of my helping but too many times my corrections are not spoken with love but sound to him like criticism or condemnation. When he tells me I usually feel justified first, “I’m just trying to help you,” I think. 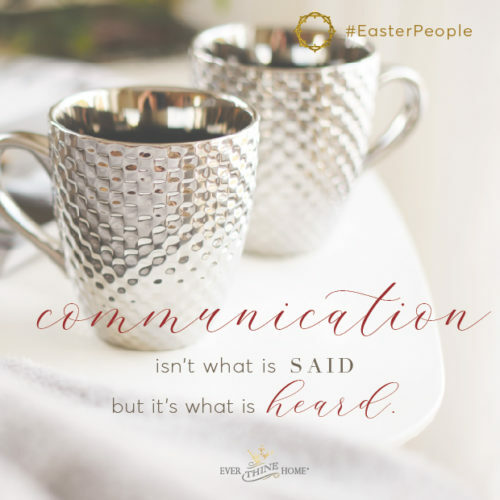 But then I remember that communication isn’t what is said but it’s what is heard and he heard a tone in my voice, intended or not, that felt unkind and unloving. I admit I don’t like being wrong. Apologizing still isn’t easy. Over and over I must choose to recognize my sin, confess it and ask for forgiveness. Then the choice is his to grant it or to hold on to hurt. And so we repeat a practice in our marriage as worn and as reliable as the ancient stone steps leading up to the temple ruins in Jerusalem. We practice the same forgiveness Jesus taught His disciples and followers as they walked in and out of the temple and all over the land of Israel. It’s taking the brokenness in my life to the Savior for His healing life changing touch. It’s asking Him to make my heart like His. Recently I sat across the table from a couple in their early 40s, listening as they told their story of infidelity. It was a crushing experience for both spouses as he felt deep regret and she deep betrayal. But living in this mix of emotions I heard a determined choice to forgive and be reconciled. Jesus knew betrayal. And He died to cleanse all of us betrayers. All three of us got teary-eyed. They said, “most everyone is telling us to quit, but we want to believe God for restoration.” They are experiencing a deep understanding that true forgiveness is not possible without the power of the cross. Every marriage faces impossible to overcome crises over the years. Sometimes multiple times. Real faith was on display that day with this broken-hearted couple. Their choices were mirroring exactly what Jesus did on the cross after He was betrayed, not just by Judas but by all His disciples, and every one of us. Jesus chose God’s plan, refusing to quit because it was hard, too hard. He chose to keep His promises, not break them. He chose to endure the pain, knowing joy was ahead. He chose to love me as He suffered, because our reconciliation was near! He chose to forgive, even though it was completely undeserved. 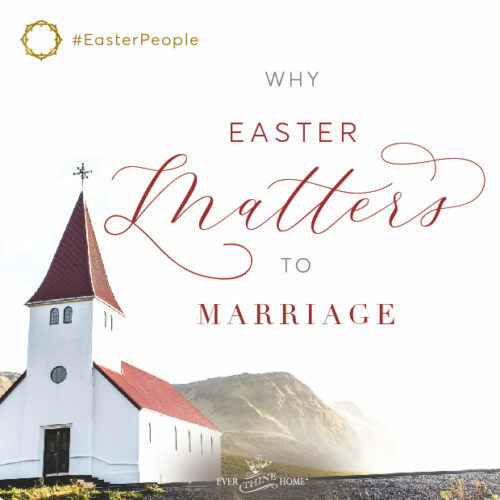 Easter shows us that if God can resurrect a dead Jesus then He can resurrect dead marriages. If God can work all things together for good at the cross He can work together seemingly impossible situations in our marriages for good. This is Jesus forgiveness … irrational and counter-intuitive. His forgiveness in us, in our marriages, drives a stake, or a cross, in the ground and says, “we will not give up on our marriage promises. We choose God’s plan and His miraculous wondrous ability to redeem. Jesus modeled impossible to forgive forgiveness for us when He said, “Father forgive them, for they know not what they do.” Might that be our prayer too in our marriages? May you make this choice for your marriage today, and every day till death do you part for God’s glory and honor and resurrection praise! May you forgive 70 times 7 as Jesus explained to the disciples. Because He is risen “nothing is too hard for God,” (Jere. 32:17). Years ago, God delivered me out of an abusive marriage, and then I was a struggling single parent for 15 years. In this desert season, I went through many hardships and devastating emotional pain in those years and finally got to the point of saying to the Lord: “If you never give me a husband, if I am alone the rest of my days, if you never deliver me from poverty and loss and pain, I will still love You, serve You and praise You Lord”!! I was at the absolute end of myself and willing to stay there if that was all God ever chose to give me. A MONTH later, the Lord introduced me to my now husband, a truly godly man, who, though far from perfect, loves the Lord with all his heart, soul and strength first and foremost. We have just celebrated our two year anniversary and are so grateful to have found each other. I am so grateful to not be struggling to survive anymore. Being a heartbeat away from losing my house because I couldn’t afford the mortgage, or dealing with custody battles, or working 3 jobs and having strangers raise my kid, or trying to find last minute rides to work because I couldn’t afford to get my car fixed and afraid of losing my job because it happened one too many times is a thing of the past, because of the amazing way my husband provides for and blesses me. I don’t have time anymore to be critical over little things. I think marital happiness depends a lot on our perspective, and God used those desert years to change my perspective and prepare me to be a truly grateful woman, and my husband knows without a doubt he is the best gift I could have ever received. It’s my joy to make sure he keeps knowing that every day of the rest of his life. Have struggled for years now in my marriage. I know I am not perfect by any means, but I have tried so hard to be loving and kind to my wife. During my darkest days of being let go of two jobs and leaning into my wife for comfort, she instead disconnected and had an emotional affair for two years. After the affair was discovered, she remained in the marriage and we went to counseling for two years, but that really didn’t change anything. We go to church together but never pray together. She never tells me she loves me and never holds hands, hugs, kisses or cuddles (which kills me because physical touch is my No. 1 love language). We are so disconnected and no matter how many years and tears of prayer, nothing ever seems to get any better. Not sure how much longer my heart and soul can hold out. I want so badly to be committed to my vows I made to my wife and before God, but I also want beauty from ashes and more than a lifeless, joyless, loveless and lonely marriage. Thanks for taking the time to comment. I have been asked to reply on behalf of Barbara. First of all, I am very sorry to hear of the difficulties you have been facing in your marriage. Betrayal in a marriage can be devastating. It sounds like your wife is there physically but has remained emotionally disconnected. I would also like to pray for you. Thank You for bringing Jack to our website. Thank You that we can come boldly to Your throne for mercy, grace and help in time of need. I ask that You would bring healing and restoration to his marriage. Help Him to trust in You through this difficult time. We know that nothing is impossible with You. In Jesus Name. Amen. we plead with YOU to give Jack’s wife a “heart of flesh.” Deliver her from this heart of stone. May she experience the beauty & freedom that comes from repentance, return and restoration! Send the hound of Heaven after her until Jack’s prayers are ANSWERED. Ohh howcwe pray she will stop resisting! In JESUS POWERFUL NAME we pray! Thanks for this prayer! May it be so! I agree before the throne with you! Hello Jack, I have great empathy for you as I have been in a dead marriage for nearly 30 years. No matter how many marriage books we read, blogs, and Christian counseling, my husband still chooses to be disconnected from me, both emotionally and physically. Our most recent counseling only made the marriage more difficult as it really exposed a pattern of emotional abuse. While nothing is impossible with God, it certainly is much easier when both parties are willing to at least attempt to work at it. If your wife is willing to work at your marriage, I can suggest Created for Connection (the Christian version of Hold Me Tight by Dr. Sue Johnson) and Love Sense also by Dr. Sue Johnson. These books discuss the EFT (emotion focused therapy) which has a success rate of something like 75% or more if I recall correctly. Father, I lift up Jack & his wife today. I ask that You will guide Jack’s wife into the knowledge of Your forgiveness, the deep, cleansing release of the redemption that only You can give. May she see and know that Your forgiveness is her strong foundation to build upon, building in Your daily grace & mercy her forgiveness and letting go of her mistakes. May she grab on to You with a humbled heart and love like You do. Re-engaging in her marriage and stepping out in faith. I believe, Lord, that you have mighty plans for a strong, amazing marriage for this couple. In the mighty name of Jesus, AMEN. Praise God for the internet & for amazing resources we can tap into like Barbara Rainey’s blog. Btw: I loved today’s FL broadcast. So wish I could be a stand in for your next video. I am struggling in a 44 years of marriage. I am a Christian, but my husband does not want anything to do with the church. He declares that he does not have to attend church to go to heaven. He thinks because he do not do anything wrong in his eyes that he is just as good as the “so call “ Christian. Over the years I have ask him to attend different church events with me. The answer is always “no”. When things does not go the way he likes I am the one that is at fault. He is not abusive. He is not affective anymore. After all these years I still want my husband to attend events with me. I am tired of being single but married. I have pray and I have pray for God to changed his heart. And still praying for our marriage. This message was encouraging. Thanks for taking the time to comment. I was asked to reply on behalf of Barbara. I hope to encourage you and offer some helpful resources for your situation. I am sorry that you are struggling in your marriage. Being in a marriage where you are at different levels of spiritual maturity is always a challenge. I am assuming that this has been the case from the start. Many times we think that we can change our spouse, but it is always a work of Holy Spirit. I have found that when I try to change my husband it only increases resistance. I think this is why the scriptures admonish wives to win their husbands over without words. 1 And now let me speak to the wives. Be devoted to your own husbands, so that even if some of them do not obey the Word of God, your kind conduct may win them over without you saying a thing. 2 For when they observe your pure, godly life before God, it will impact them deeply. This has not been easy for me by any means. I have learned to entrust myself to God, and focus on my relationship with Him, allowing God to change me first and foremost. If Holy Spirit wants me to say something, I say it in humility, but I make sure He wants me to say something first. I have learned to focus on all the things my husband does right and praise him for those things. When you do this, your husband will feel respected and will be drawn to you. That is one way that makes him feel loved. In regards to some helpful resources, you may enjoy this website. It is for wives that are in marriages such as yours. I hope it encourages you. Also, here are some FamilyLife Today programs that you may find pertinent to your situation. I’d also like to pray for you. Thank You for bringing Patsy to our website. I thank You that we can come boldly to Your throne for mercy, grace and help in time of need. I ask that You would help Patsy as she seeks to honor You in her marriage. I ask that You would release a spirit of healing and unity in their marriage, for where there is unity, You command the blessing. Make them one as You are one. In Jesus’ Name. Amen. Here’s another resource for unequally yoked marriages. Be Jesus for your husband. Let him see Him through you. God bless! Thank you for your honest transparency. Yes, after 40 years, I am finally ready to give up “helping” my husband and to practice loving him and doing him “good for the rest of his days.” If I can just treat him more and more the way I want to be treated and I can do it first and not wait for him to behave in any way how I have longed to have him be. WOW! What a blessing to have read this article. And I thought I was the only one struggling with perfectionism, fault finding and needing to be right. After 47 years of marriage, I find myself judging and criticizing my husband for insignificant things that a week later really wouldn’t matter. This article has helped me to do self-inventory and realize my own inadequacy….practice forgiveness….and ask for forgiveness. I’m so glad it was an encouragement to you! After 22 years of marriage, my wife and I had both stepped back from God. I was unfaithful to her and also demanded a divorce, which she reluctantly gave me. I later remarried, had another son, and divorced again. I sought God and found Him faithfully waiting at my side all along. After being divorced from the wife of my youth for 5 years, God has miraculously brought us back together. It has had it’s struggles but we are attending pastoral marriage counseling and gladly allowing the Lord his place in our lives. With God as the center and focus of our relationship, we will soon be planning our re-marriage. I am so very happy that my soon to be again husband, and I will be attending an upcoming Weekend to Remember in Anchorage, AK. As the Lord has made it His will and by His grace to bring us back together, I must say that the Lord must be in the center & given complete control of your marriage. The Lord has truly turn the ashes of a once beautiful marriage into yet another beautiful future. And yes, as this article states, it is all possible through forgiveness & loving as Jesus loves. Amazing. May I suggest getting the book called “The Five Love Languages” by Gary Chapman? And a devotional book called “Love Language Minute Devotional” also by Gary Chapman to go along with the book? My husband and I are reading the devotional together every day and there is a written prayer at the end of each one. Then each of us has our own book called Five Love Languages. We read at chapter to ourselves and then we get together and one of us reads the chapter outloud as the other one follows along in their book and then discuss it together. This way we discover each other’s love languages which has been a tremendous help in our marriage. It is excellent. God bless. Let us EXCUSE rather than ACCUSE our spouses over trivial matters. This stops my mind from going crazy all the time. Thanks Barb. What an encouragement! I have so many couples that need to hear this beautiful message of forgiveness during this Easter. I’ve been separated from my husband for over two years while he’s been with another woman and they are now expecting a baby next month. I haven’t stopped praying for a miracle all this time. God has allowed this trial thet feels neverending and excruciating to really reveal Himself to me, calling me to fully surrender and trust Him which has also enabled me to forgive my husband and this other woman. It feels like the weight of the world lifted off my shoulders when I think of the load He carries for me so I do not have to worry about all the unknowns of the future. He’s completely taken over my heart and mind and I wouldn’t trade it for the world! The Lord has used this time to show me where I’m weak and where I need to be refined! Furthemore, He has provided so many opportunities for me to encourage many other women in similar situations & in turn they are a light to me as well! 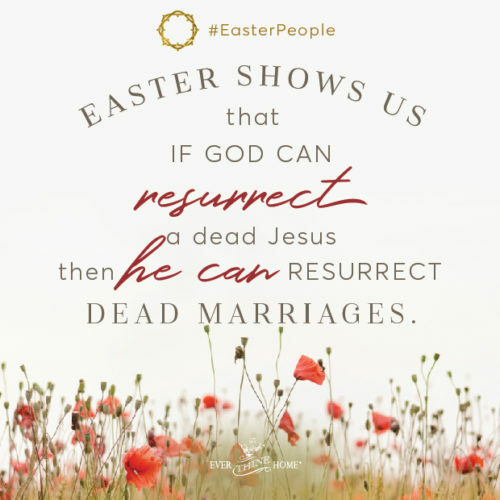 I’m incredibly thankful for seeing this article today as it affirms what God has whispered to me that it is not a mistake my wedding anniversary falls on Easter this year – as the article said, He can and will resurrect seemingly dead marriages. He is a God of the impossible and that brings hope and peace only found through Him! Thank you for your ministry! Have you looked at the resources at Rejoice Marriage Ministries website? I recommend them. God bless you! My husband left 2 years ago, yet I still believe God is doing a work in both of us during this time of healing. Seperation has been a time to reflect on who is really in control! Christ truth WINS! I’ve been really struggling in my marriage and praying we can find that forgiveness for one another. I bought a weekend to remember trip I my husband doesn’t want to go. Pray we will do whatever is in Gods will for us. Just what I needed to hear this day! Thank you! Thank you, I love this message. Often in marriage we choose to pile up the wrongs to promote our “being right”. But none of that mattered to Him when he choses to love us, when he chose to die for our salvation, joy, our forgiveness of ourselves AND others. We can chose Christ, including in the place that can be the most painful and unforgiving – our home. His truth transcends all. Thank you Barbara. I too struggle with perfectionism & OCD tendencies. It’s understandable with things like home decor & wanting things to be ‘just so’ but when it spills over to our spouse, children & other relationships, it can be toxic. Wonderful writing! Thank you. I needed that!